After a shocking twist and a shocking cliffhanger in “Manifest,” the eighth episode of Luke Cage resets all of our narrative expectations. In the first half of this season, I thought our Big Bad was Cottonmouth. Mariah was a sidekick and a foil to Misty Knight. Shades was an evil asset. With Cottonmouth’s death, all the pieces on the chessboard have moved around—and it’s the queen we have to worry about. Or is it? Shades had mentioned Diamondback before, sometimes in ways that made me think Diamondback was a corporation rather than a person. (I assumed it wasn’t a baseball team.) Turns out it’s a person named Stryker. And Stryker’s got a real issue with our hero, Luke Cage né Carl Lucas. The Judas bullet is fascinating tech, and I love the way it ties into “The Incident,” but I hate that our bulletproof hero isn’t Chitauri-proof. Then again, it’s safe to assume Luke won’t die, so the Judas bullet gave Luke a good excuse to spend time with Claire Temple, medical researcher extraordinaire. Claire wasn’t the only female badass in this episode, either. Detective Misty Knight had some great moments—like deducing that Candace didn’t trust Cottonmouth enough to sleep with him—and some less-great moments: Misty attacking Claire upset me more than Mariah killing Cottonmouth. I’m tempted to say it’s out of character for Misty to do something like that, but maybe it’s a side of her character we haven’t seen yet. Either way, the chaos in Harlem is pushing her over the edge. And that overall aesthetic—Chaos!—brings me back to where we started: this episode’s narrative reset. I recently re-read and rewatched noir classic The Big Sleep. In both the film and the book, shamus Philip Marlowe solves the original crime about halfway through. But one crime leads to another, and a good detective can’t let a sleeping dog lie even if it means uncovering more fleas than he wanted to. Luke Cage obviously channels Blaxploitation movies, but its plotting is more labyrinth-noir than straight narrative trajectory. That may be why this episode feels so transitional. The new powers—Shade and Mariah—are still working against Luke by trying to frame him. Misty is supposed to arrest Luke. Claire is caught in the middle. Luke is injured and dealing with this new weird threat Stryker. A lot more is happening now than I expected to happen in this season. That doesn’t mean this episode lacks cohesion. It takes place over the course of one night, ending just as the sun begins to dawn. I like that we got to spend some quiet time in the Harlem Women’s Clinic, and that segment was a nice contrast to Luke’s eventual battle with Stryker in the beautiful theater. Those two have some history, and Stryker claimed to be responsible for sending Carl Lucas to jail, as well as the torture he endured there. And apparently they're brothers, which was as much a surprise to me as it was to Luke. Huh? • You know what I don’t need more of in my life? Scenes involving scalpels. • Stryker, Luke’s nemesis, is not the same as General Stryker from the X-Men canon. • Dear Marvel, I want Claire Temple to live a happy life. I want her to find an apartment, settle down with a nice guy—if that’s what she wants—and make a good living patching up superheroes. Please do not ever kill her. Also, could you please tell me where she got her coat, because I want one. Thank you. I wonder if Claire will be Coulson or Fury. I think Misty should be cut a little slack, Being held at gunpoint by a maniac would make anyone irrational. The Judas bullet thing was perfect, in the sense that every time Luke got hit in this episode -- which was a lot -- I felt for him. 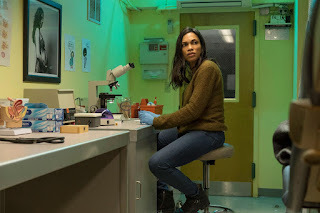 I've probably said this before, but Mike Colter is the best thing about this series, and Rosario Dawson is a close second. Would that make Simone Messick a close third? That theatre was so incredibly gorgeous slash super-ornate slash ugly that it actually detracted from the action sequence. I kept wanting to stop the video and look more closely at the decor. Luke, I am your brother! Well, Diamondback didn't disappoint. He got some balls, going into fistfight with a superhero. And he doesn't seem to have superpowers of his own. I still wonder though, if he was metaphoric with this whole brother thing. Billie, I think sometimes Dawson even outperforms Colter. I've just pictured Claire and Misty together. Now I can't get this image out of my head. Well, Stryker/Diamondback said his dad was a preacher - I'm assuming he's Luke's illegitimate half-brother. Would explain the resentment. Josie, that letter to Marvel was amazing! By the way the radio code Misty used, 10-13, means employee in life or death situation.